For my first story of the second decade of Retro Renovation: A love story. 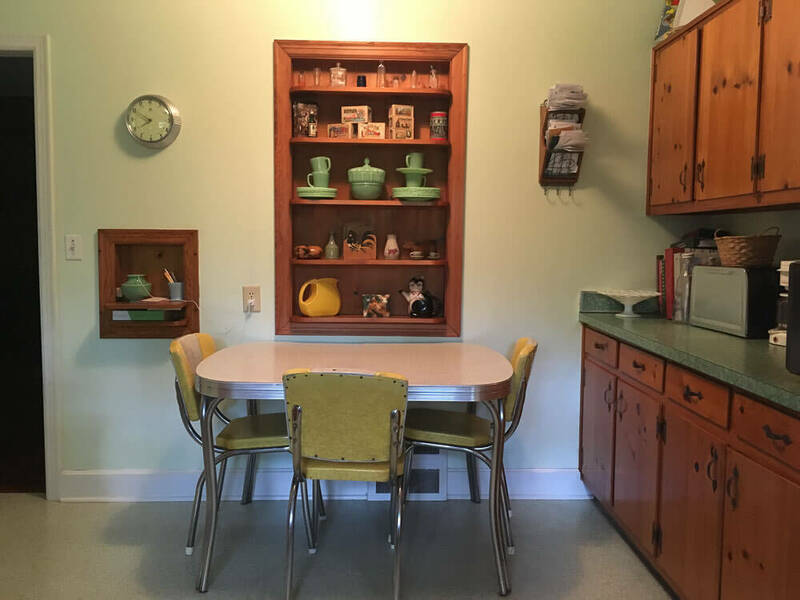 Amy bought her grandparents’ time capsule “city” house, a place full of happy memories. 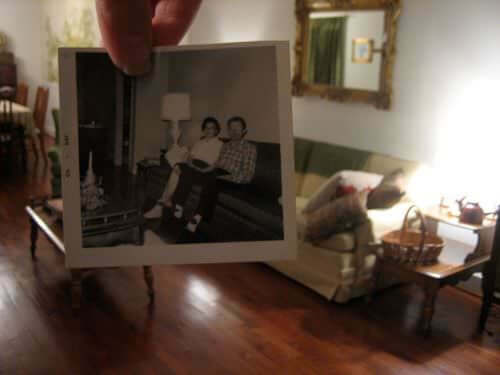 Now she is making the house her own — preserving all the basics and slowly mixing the old with the new. Hi there – Love your sites! I wanted to share a bit about the house I live in and see if it’s of interest to your readers (and get any of their tips for my continued decor experiments). 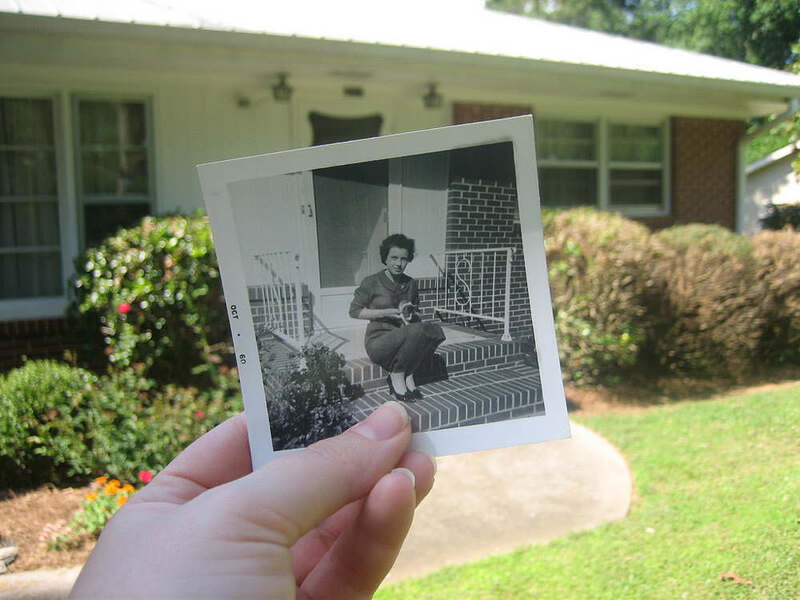 My grandparents built a modest brick house in 1959, where they lived for the next few decades. 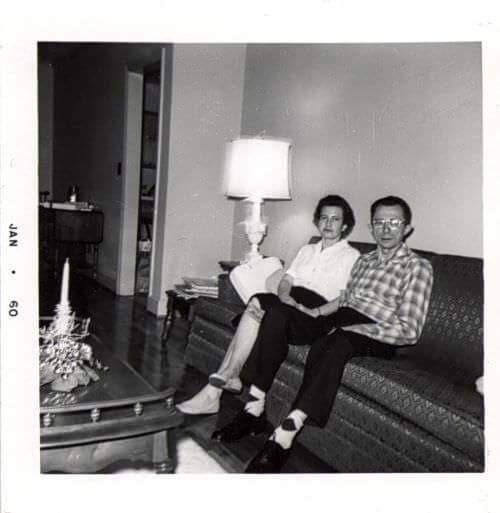 It was their move to the “city” (actually a small town north of Atlanta) from the farm about 15 miles away. I bought the 3BR/2BA house from the family after my grandparents’ deaths in the early 2000s because I had always loved the style + had many fond memories there. 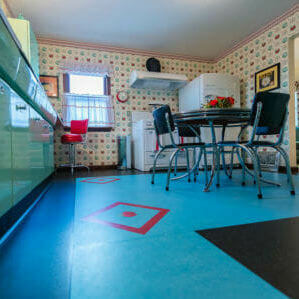 While my grandmother redecorated a bit every few decades, most of the house remained as it was from 1959. 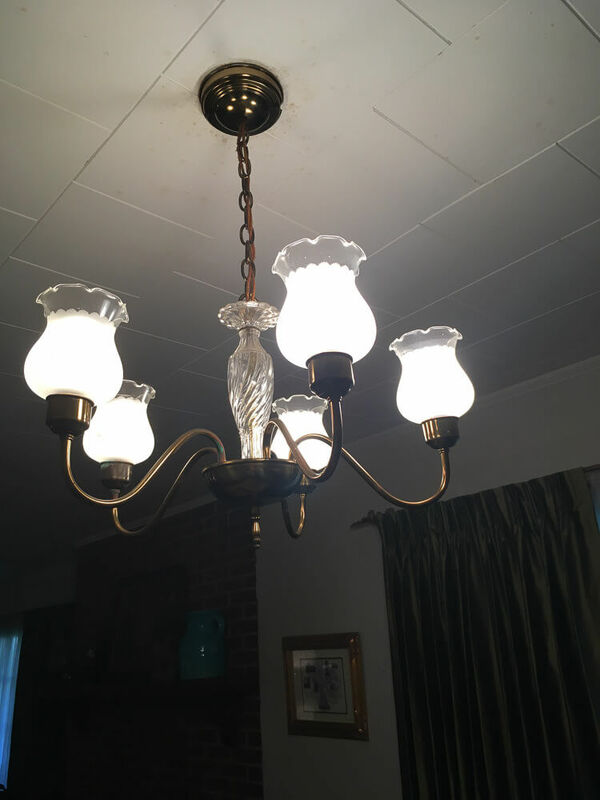 And when I bought it, I kept it mainly as it was, too — partly out of financial necessity at the time and partly out of love of things vintage. First, pink bathroom! This is all the original tile, fixtures, shelves, toilet and sink in the bathroom off what was then my aunt’s bedroom. It’s now my guest bathroom (and guests always get a kick out of it!). Growing up, I loved the lavender curtains on the shower and windows and purple towels. 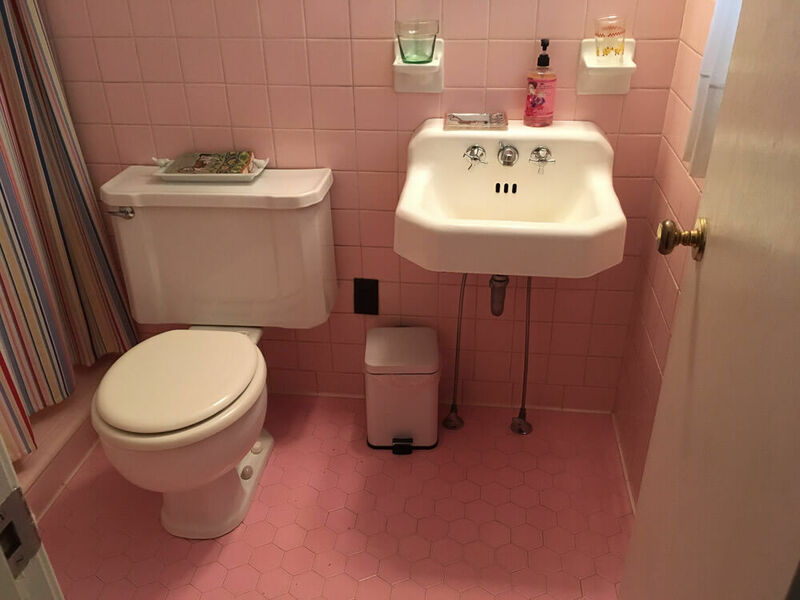 When I moved in, I got rid of those, but decided the pink was unique and embraced it. 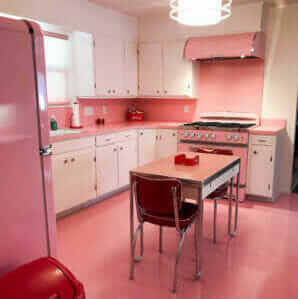 Next, the kitchen, which is one of my favorite rooms. 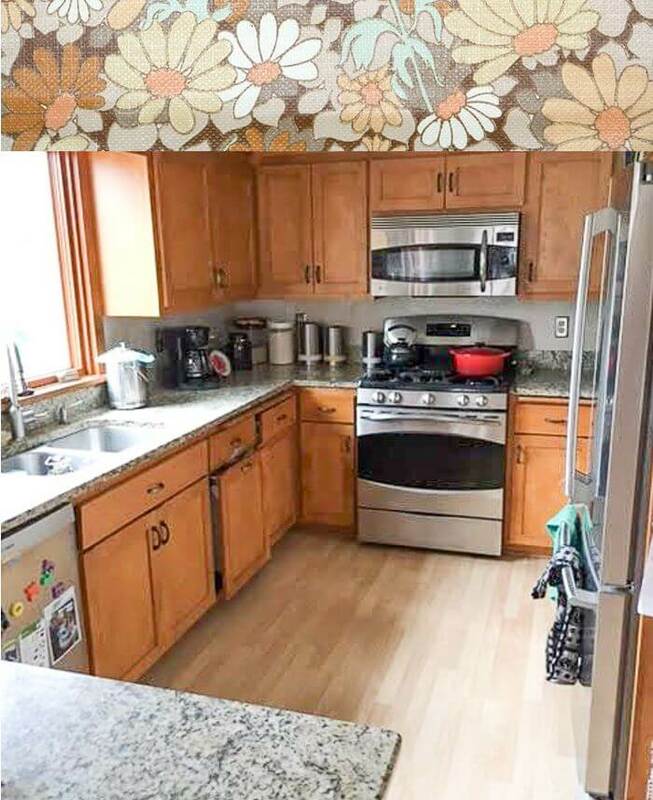 No all-white open kitchen here — a kitchen to me needs COLOR. 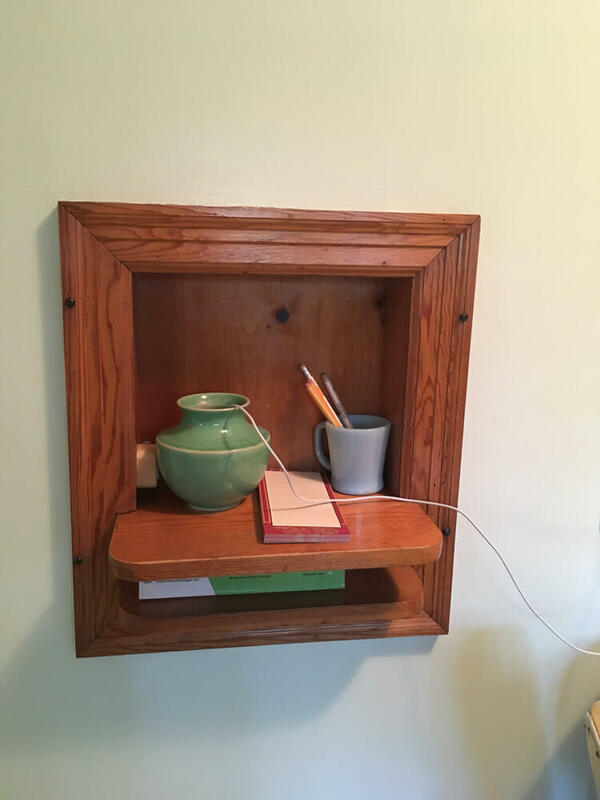 Original cabinets built by local builders, original Formica countertops, original vinyl floor, original fixtures — just about everything including the phone nook, which I now use as a charging station for devices. The stove is also original and everything still works including the little oven light to check on things without opening the oven door. My grandma made some excellent food there! 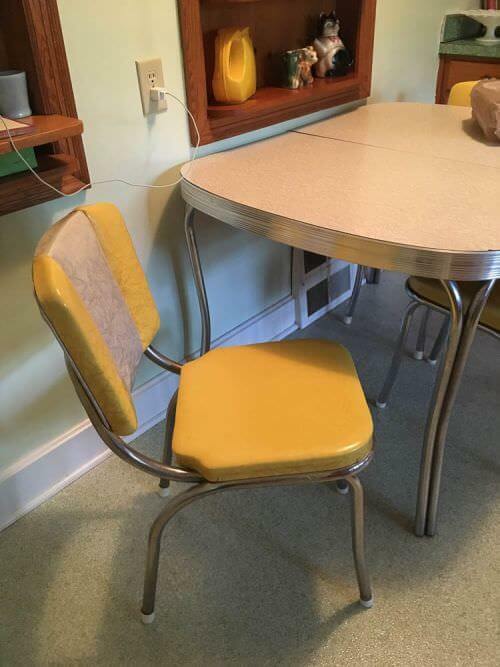 The old diner table and chairs are NOT original to the house — my grandparents had something similar but replaced with a small wooden table in the late 1960s. I found this whole set for $80 at a junk shop in 2001 or so, a few years before they became popular — and expensive! The refrigerator also has a story. This was my grandparents’ fridge (a Westinghouse from 1941, I believe) that is even older than the house! They had this at their farm house, moved with it (I think) to this house, and then when my parents were married in 1969, they took it. After my parents established a household, they used the old fridge as a “second” fridge in the laundry room for extra milk, food, etc. When I bought this house, I got rid of the 1970s avocado green fridge (if only I knew they would come back in style!) and asked my parents for the 1941 fridge for the house. I only needed to buy them a budget new fridge for them to use as their “second.” It was a bargain! My new old fridge only needed a coat of appliance paint as it had gotten a little scratched up over the years. But it has been IN CONSTANT USE SINCE 1941! Next, the dining room and living room, which is one long room (including an entry way). 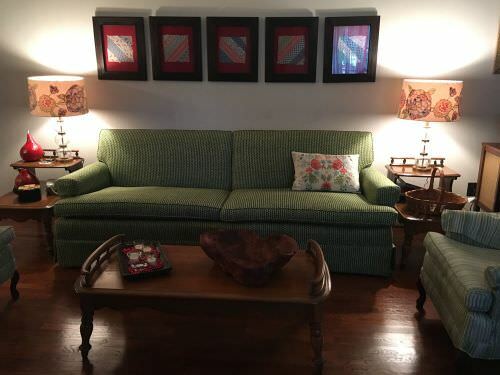 The sofa, 2 matching chairs, coffee table and end tables are original to the house. 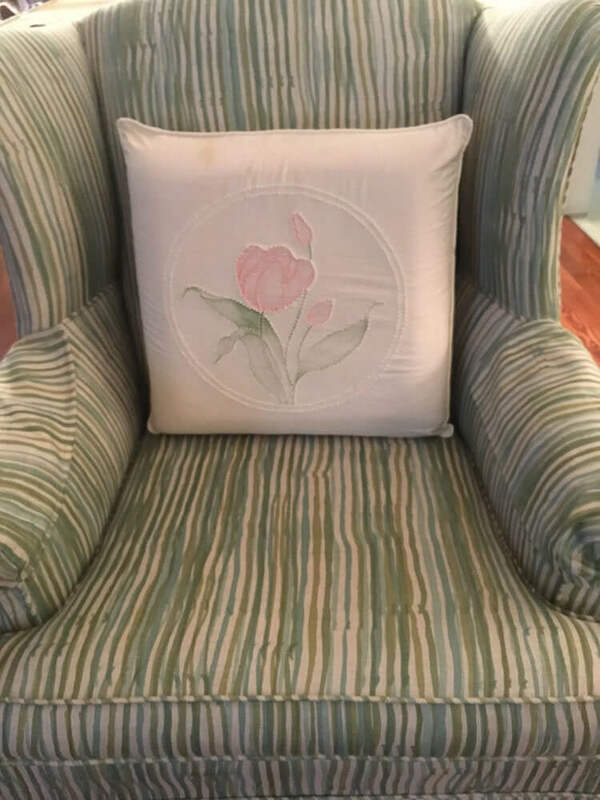 My grandmother had the sofa and chairs recovered about every 15-20 years. I wanted to return it to a retro feel but without it looking too staid or too trendy. The dark green polka dot fabric and the wavy stripes I thought hit the right balance (from Hable Construction fabric). Side note: Over the sofa, I hung framed quilt pieces from my great-grandmother. Funny how something so old looks modern! 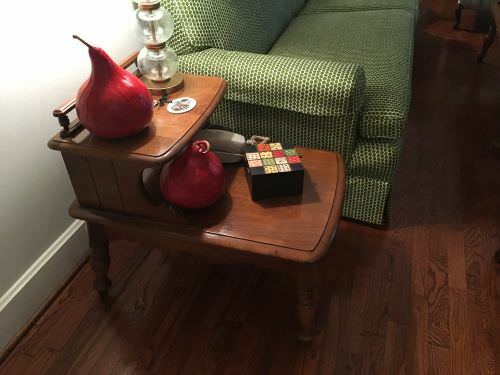 My dad carved the wooden bowl/sculpture on the coffee table. The console is original and still works great, with a big sound today’s devices can’t touch. 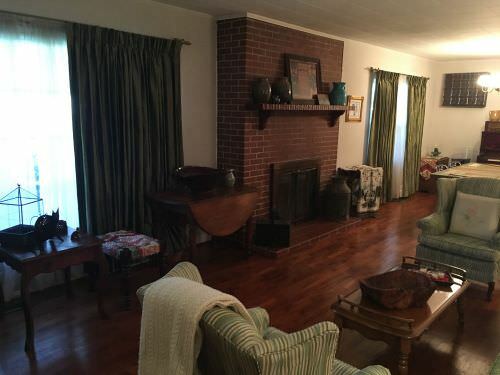 The red oak floors in the living room once had gold carpet added on them in the late 1970s, but I tore that up and polished up the floors to their original beauty. 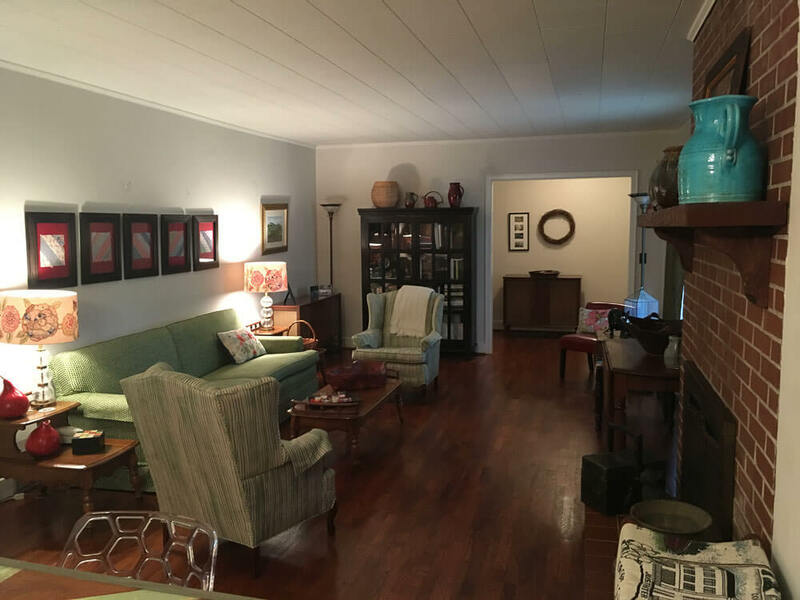 The rest of the house has wood floors as well that have never been covered, and that are still waxed the old-fashioned way, with decades of “patina” on them that can never be replicated. They also make excellent run-and-slide fun when you’re in socks! The curtains are from the past few years but in the same material and style as my grandmother always had, just different colors. I love green, while she had originally a pale beige and then a 1970s tannish color. The gas fireplace replaced the regular fireplace sometime in the 1980s — I still haven’t figured out what to do with it. I’d like to remove it and return to a wood-burning fireplace, but open to any of your readers’ thoughts. In the dining room, I have grown to love the overhead light (when I first moved in, I just didn’t like it and longed for the “sputnik” lights) and the mural, which I was originally so-so on. The mural was added sometime in the early 1970s. It used to be a blank wall and while my Dad was serving in Vietnam, my grandparents had a huge map of the country pinned to the wall where they would listen to the news and track locations mentioned and where my dad was. 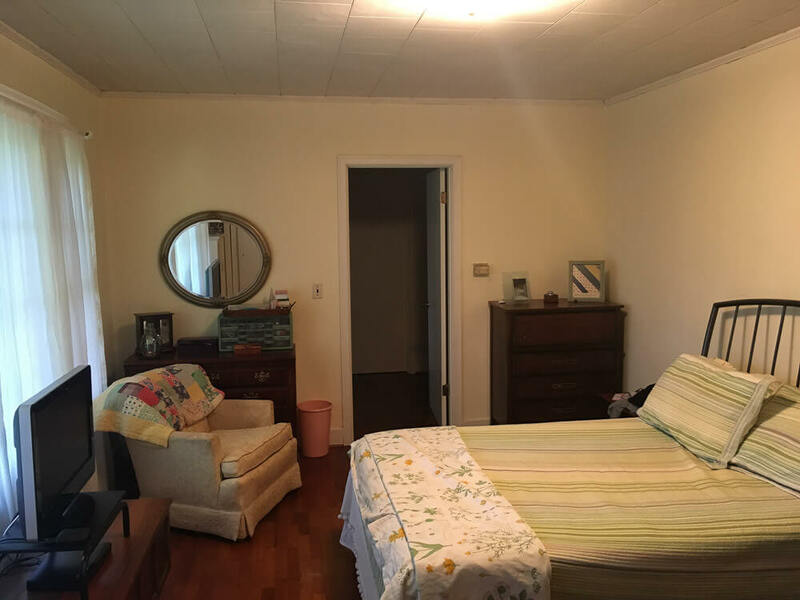 I’ve included some other photos of the bedroom (nothing too vintage-y in there except light fixtures, floors, closets and cedar chest). 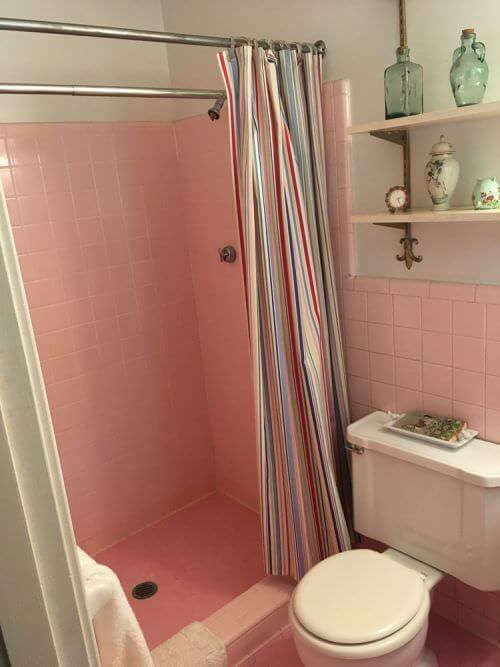 It was originally painted pink with pink curtains and then wallpapered later with pink stripes/roses. And the main bathroom next to it. 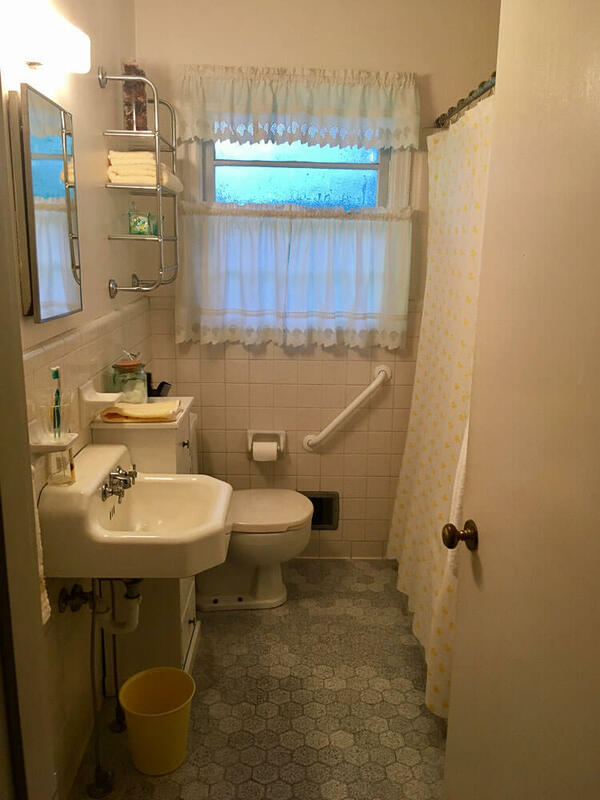 The bath still has all of its original fixtures, tile, toilet and sink as well. 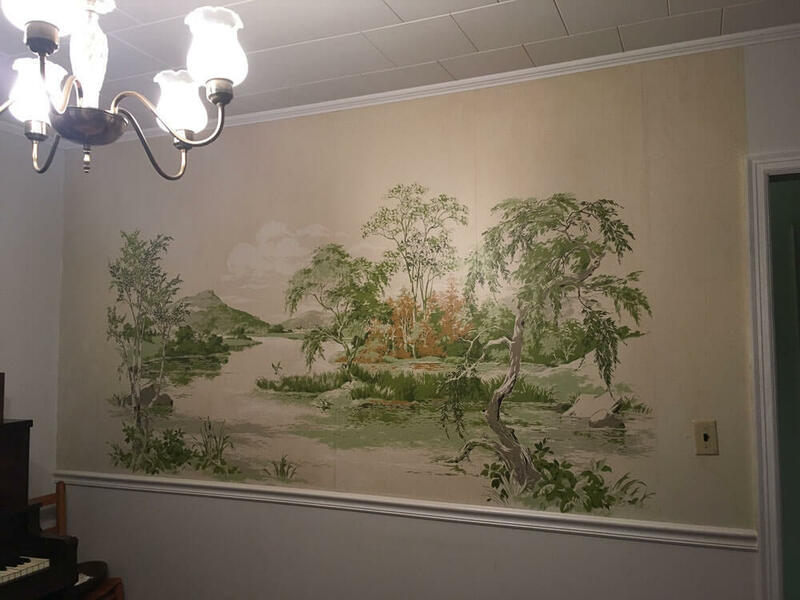 It was originally painted a light pink and then wallpapered with a pink background and dark pink flocked flowered wallpaper in the 1960s. Can you sense a pattern here? 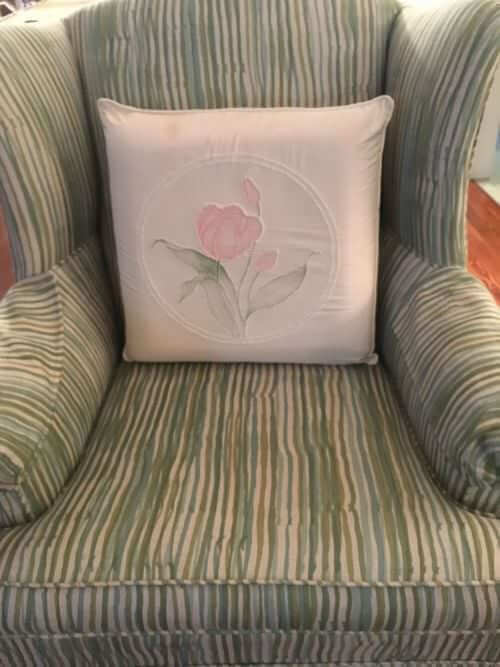 My grandma loved pink! I looked on the wallpaper with fondness, but it was something I just couldn’t see me living with on a daily basis. 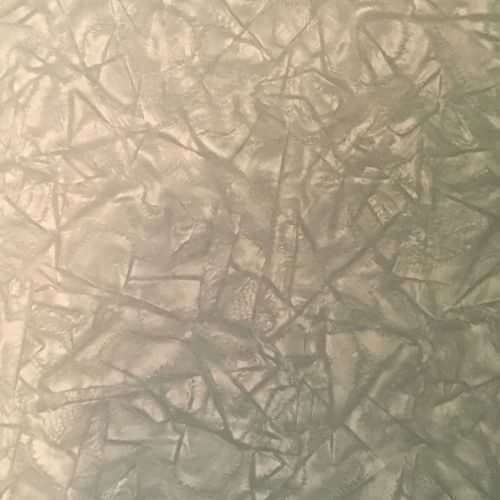 Plus, the wallpaper was getting so old, the flocking was rubbing off. Note – the inside of the bathroom closet and the bedroom closet are still in their original shades of pink. The other bedroom (my study/storage room) was my dad and uncle’s. It’s still light blue with the original blue curtains. 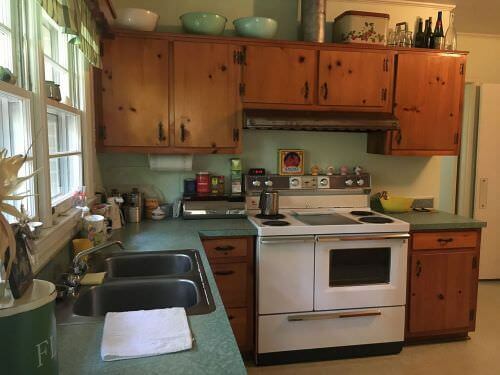 There are a couple of inconvenient things about an older house, but overall, I find that older design holds up better and is more efficient for daily life. When I first moved in, I didn’t have tons of money to completely renovate or redecorate, and now I think that was a blessing in disguise. I learned to appreciate some things over time and for the things I did want to change or invest in, I had time to think about what I truly wanted so that hopefully some of this will last another 60 years. One question I’m curious to get your readers’ takes: What’s their advice on balancing the old with the new? Anyway, that is most of it. 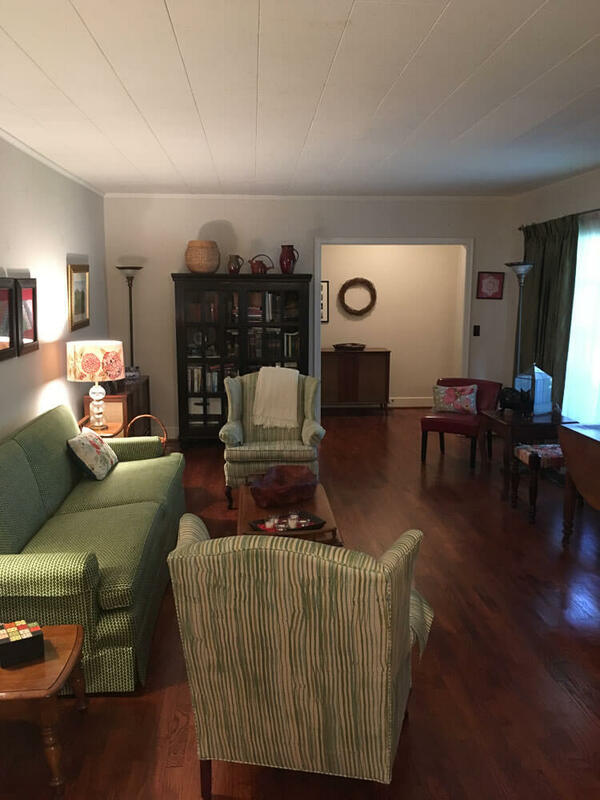 My house is not perfectly staged, but I hope you or your readers might find it interesting, warts and all. 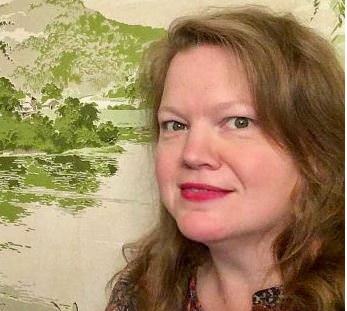 I know I love perusing your readers’ photos — the more real and lived in, the better. Thanks for the wonderful site, the continued inspiration and the whole reason I’m on Pinterest. Well, first off, Amy, it doesn’t seem that you need any decorating advice from anyone — you are doing a terrific job! 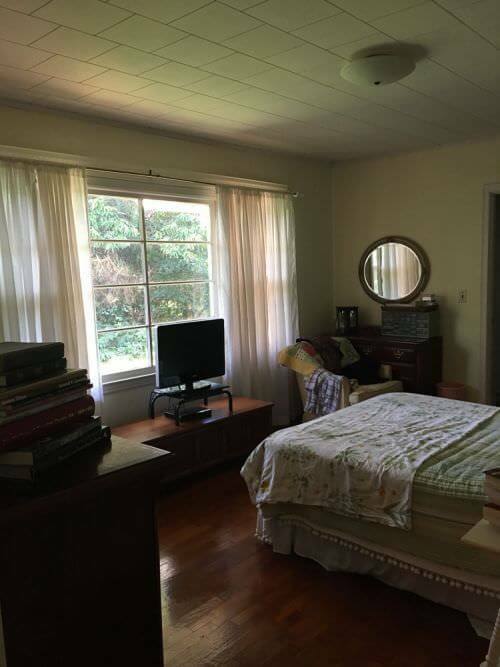 Indeed: I love the framed quilt pieces, and that dining room table, oh my. The refrigerator story! 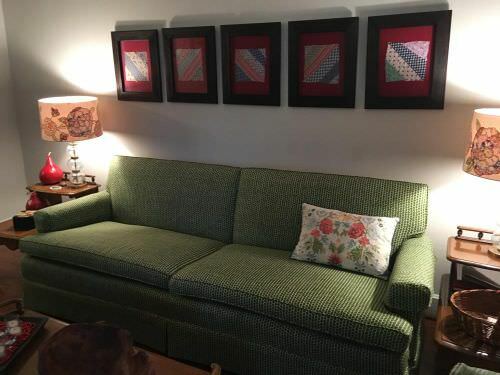 The sofa that’s still there — and I think you did a great job with the upholstery! All your family photos! Readers: Tips for Amy on mixing the old and the new? 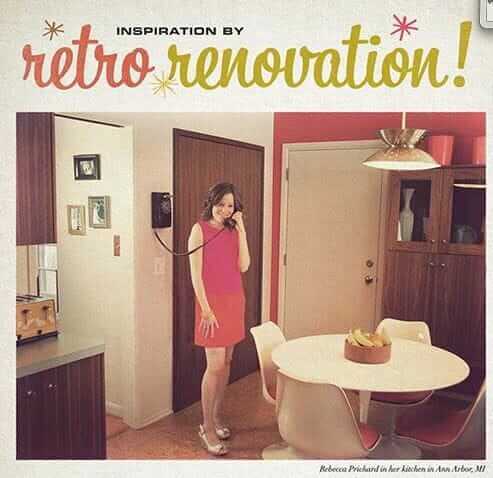 Rebecca and Keith’s Mad Men kitchen remodel — and Mad Men ad designed for us! Amy, you have such a beautiful home! As a Georgia native, I’m interested to know what city this is in? 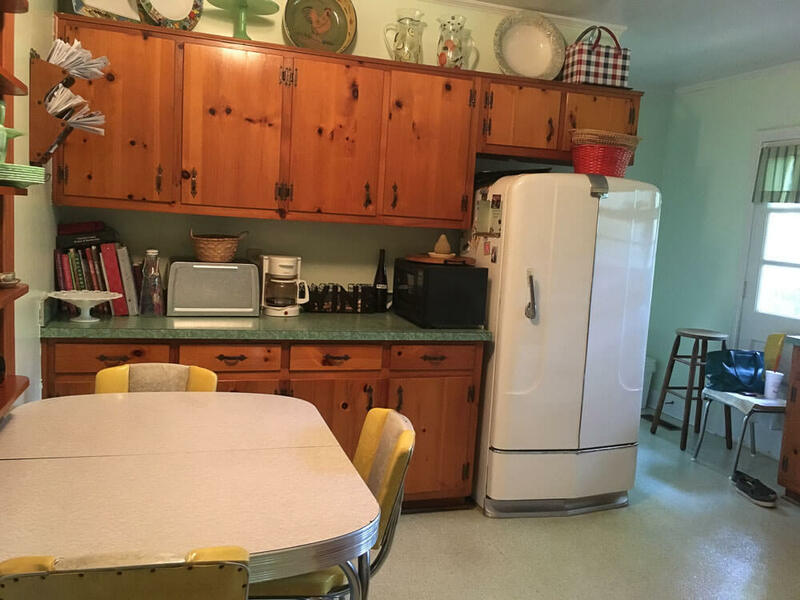 I have been thinking about that fridge since I first read this post, and marveling that it’s been working for 3/4 of a century. I’d love to see the inside. Could you post a picture of it? How beautiful! That is an a mazing house with the best memories. Amy’s grandparents would no doubt be delighted with the wonderful job she has done! And they would probably be “tickled” that their fridge that served for generations is still going strong. That fact speaks volumes about the quality of American mid-century products. Amy can also be proud that she has retained this house that has so much significance for her family. 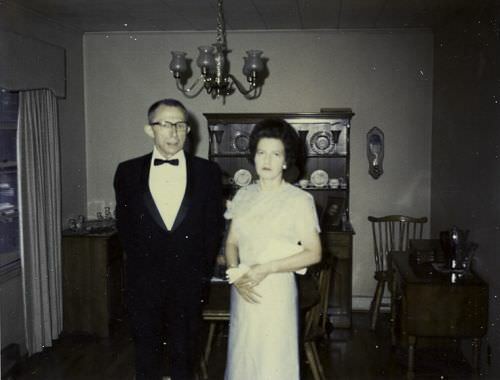 My own goal, since my teenage years, is to get back the midcentury home that my father designed and built for my mother before she died. When Daddy was sick and getting on in years, his brother-in-law tricked him into essentially giving our family home to him. 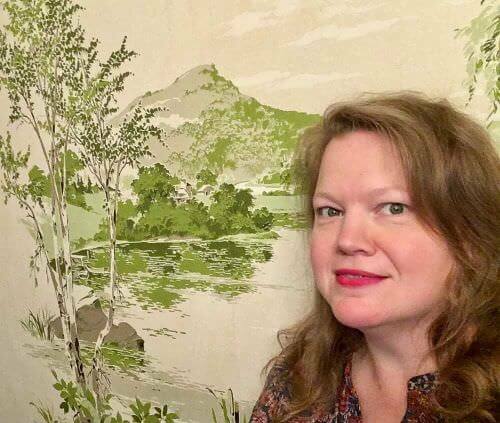 I love the mural in Amy’s home, and have tried to find similar wallpaper accent pieces on eBay and at auction houses, with no luck so far. 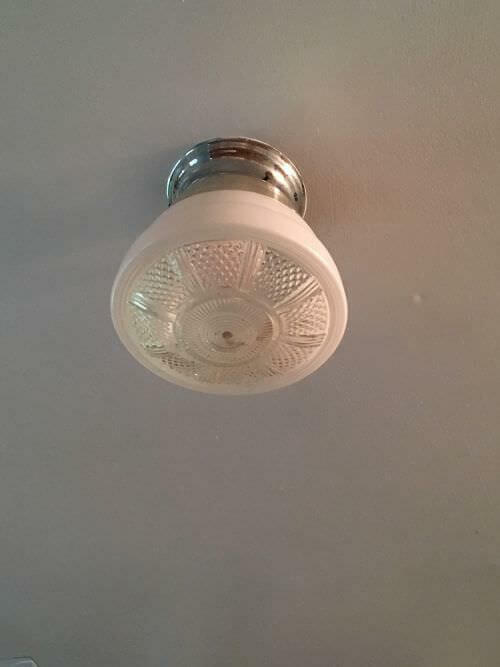 Does anyone know which companies made them? 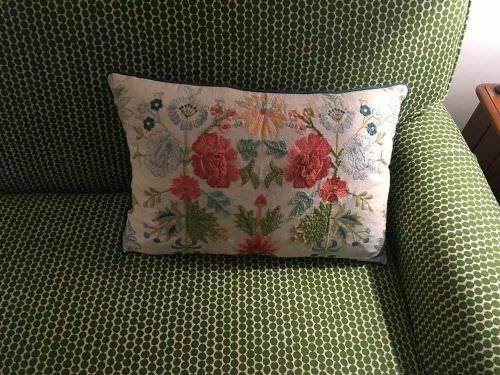 Thibaut used to still make them but they had a big liquidation a few years ago and all our readers snapped up the last inventory. You can watch ebay, but these are hard to find. Thanks very much, Pam — I’ll keep an eye out for Thibaut!